Our shop offers free equipment troubleshooting advice by telephone or e-mail. I don’t know it all but I have a lot of experience and sometimes know where to find the answers. Sometimes I can’t help at all, but I try. I know the visitors to our web site enjoy reading the questions and answers that are included there, they e-mail and tell me. Now and again I will post some here. Q: My 1978 John Deere 316 with a Kohler engine starts with a jump but the battery won’t charge. I dont know if it is a voltage regulator or if the starter has a generator built into it. I would appreciate any advice. A: No, you do not have a generator built into your starter. Your engine has an alternator built into the engine under the flywheel. Take a test light, turn on the ignition switch, touch the center wire on the voltage regulator with the probe of your test light. The light should light, and if it does, then it would tell you that your voltage regulator needs to be replaced. If the light does not light that would mean that you have an open circuit in the ignition switch or the electrical circuit. Q: I have a Ford 120 with a Kohler 321 engine with an electric clutch to operate the hydraulic pump. I think the bearing has gone bad and I don’t know how to remove the clutch. Is it threaded on or pressed on or…. Please Help. I need this tractor. A: They are usually bolted on the front of the engine, meaning the crankshaft. Take off the other nuts if you see them on the clutch. Then part of the clutch assembly should slide off – but this very seldom happens. The hub is usually rusted to the crankshaft. If this happens use a lot of penetrating oil and pry back and forth until it starts to loosen and keep oiling it. After it is off, clean the crankshaft with some emery cloth. 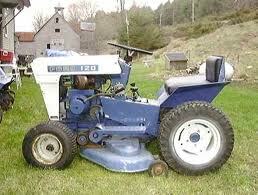 Q: I recently bought a 1970 Simplicity 3212H tractor. I new it either had a rod knock or something so I took the engine out, replaced the piston, and put the engine back in. The tractor runs much better, but is there any way that you know of to adjust the hydrostatic rear end for a bit more speed? A: You can check the hydro linkage if you are getting the maximum stroke on your linkage. I can also go through them and come up with a fair amount of a higher top speed. First of all, thanks for providing such a great site: I have a couple of questions: I have an older 318; might be the first year model made. I’m the third owner and really like using it. I’ve been having trouble getting the pto to re-engage once it is warmed up….i read earlier that this could be a clutch going out. Is this an expensive repair? there also has been some extra vibration (like a belt going out) and although i do have a well worn belt on the main mower drive, the vibration will continue even after i’ve shut the pto off…. when i throttle down it eventually stops….against my better judgement I tryed to continue to mow grass and it seems to come out of it when it warms up. It doesn’t really seem like an engine knock, although the engine is quite tired, is something else rotating near the engine that can get out of balance. I really like this tractor but if the clutch is going, and the engine is weak, etc….Is it worth the repair…..the transmission, steering and so forth seem to operate great! I use it for blowing snow. I would also like to put a small blade on the front to push small piles of dirt. Is there something like that out there? 4′ would be too wide. Enough questions for now. Thanks for any answers you might have. Glad you enjoy our site, thanks. It sounds like you have a bad PTO clutch coil. They are around $150. You need to check your driveshaft for a loose or sloppy splined yoke. Well, as usual, I search around and find some good people willing to help folks with whatever problems come up. Thanks for doing this. I have a 2004 Cub Cadet 1042 19HP (Kohler) Yesterday I was just mowing along without a care in the world and she just stopped cold. Since it was obviously electrically dead I looked for, and found, a blown 20 amp fuse just below the starter switch. A 40 cent repair and she started right up. However, I know that fuses don’t just trip without a reason. What reasons should I look for? It’s still under maintenance for another 20 months so I’d like to get the underlying cause fixed. Interestingly, the clock was on exactly 60.0 hours when the engine went away. Check for a short in the wiring going to the safety switches. Also check out all of the safety switches.